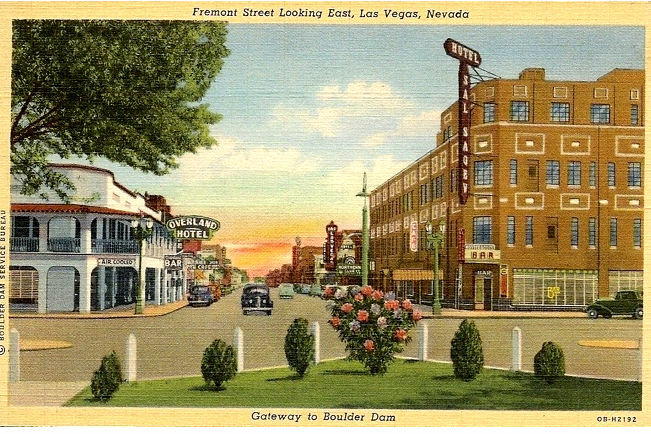 Looking east on Fremont Street in the 1940's. If you were standing on the spot of this photo today, you would be at the Plaza Hotel and Casino. 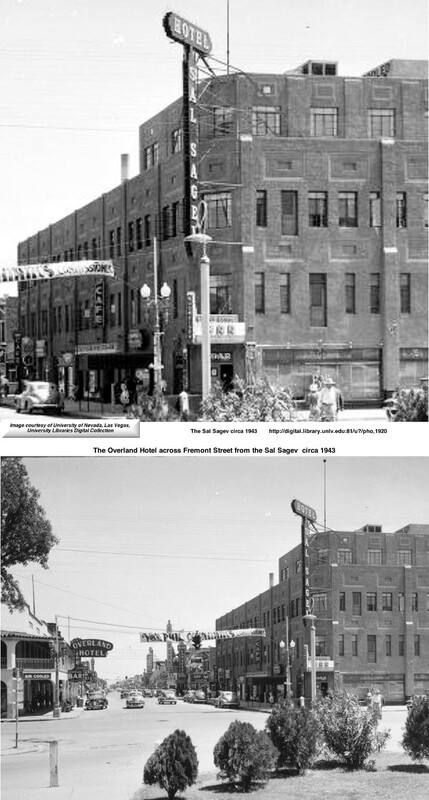 On the left is the Overland Hotel which later became the site of the Las Vegas Club. Below is a linen postcard depicting the same scene. 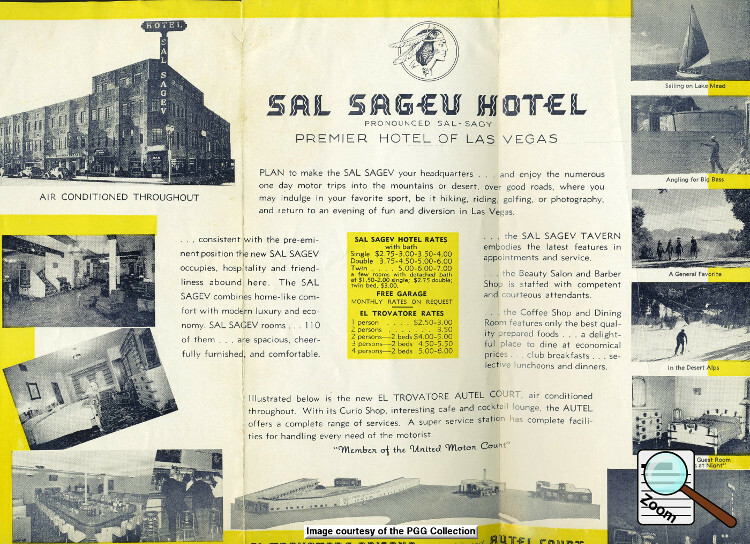 In 1931 the Hotel Nevada was changed to the Sal Sagev Hotel. as it's been researched and written about eloquently by the late great Gene Trimble in this article. Abe P. Miller was born Aug. 19, 1912. to John F. and Rosa Miller. 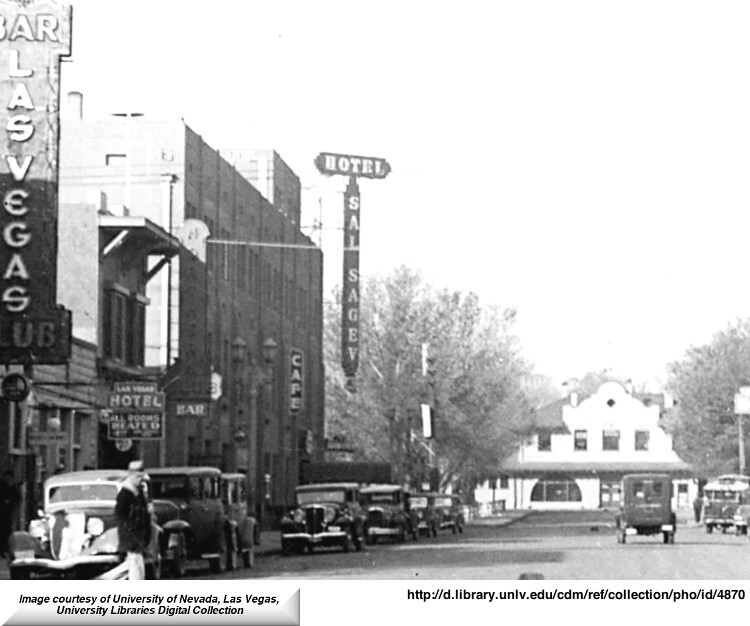 He attended school in Las Vegas and graduated with honors in the spring of 1930. In October 1930 he was at Northwestern University on the freshman football team of Northwestern playing second string center. 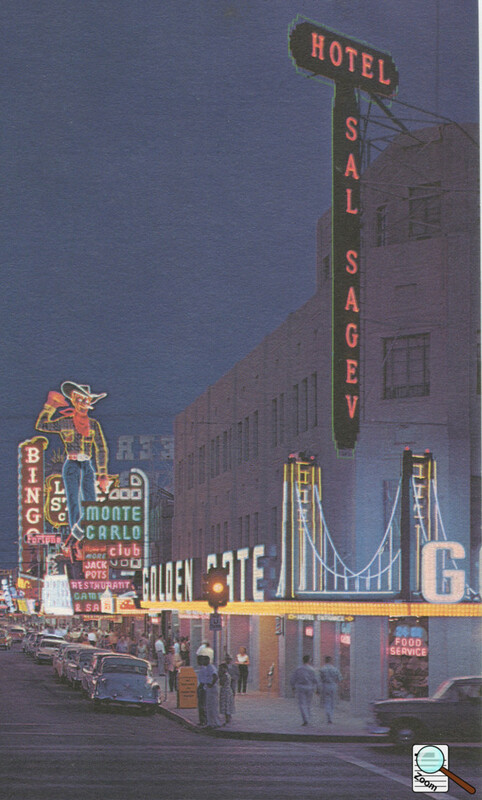 On July 27, 1955 in the first meeting of the newly formed Nevada Gaming Control Board was the recommended approval for the new Golden Gate Casino in downtown Las Vegas. The new casino would be on the ground floor of Sal Sagev Hotel. A group of 23 men would own the new casino and then sub-lease it to the gambling operators. A total of nine gentlemen were recommended for approval of the gambling license. Abe Miller was noted as the owner of the hotel and would be paid $2300 a month rent and 5% of the net gambling profits. For that reason Abe P. Miller's name was added to the gambling license. The other men recommended for approval as owners of the casino were Alfred Durante, Leo Massaro, Italo Ghelfi, Robert Picardo, Fred Detore, Bernard F Perata, A. A. Harris, and Remi Gacherieu. Each of the eight men would own 12 1/2% of the casino with Abe Miller receiving 5% of their net gambling profits. A newspaper article in 1959 said that Abe P. Miller was a member of the Nevada state planning board and that he resigned that position as of May 23, 1964. In 1961 Abe P. Miller was at the center of some of the desegregation efforts in a heavily segregated Las Vegas. The state of Nevada asked for contempt citations to be issued to Italo Ghelfi and Abe P. Miller as casino executives of the Golden Gate Casino, and John Sivak and Carl Woodruff who were their security guards. The citation stemmed from charges by an African-American paraplegic that he was forcibly ejected from the Golden Gate on July 4, 1961. The four men named refused to testify in the case before the Nevada commission on equal rights on racial discrimination in Las Vegas. On May 27, 1962, district judge George Marshall dismissed the complaint against the operators of the Golden Gate Casino. Judge Marshall dismissed the complaint saying “the issuance of a subpoena would require at least a meeting of the board to authorize the action”. In the book, Beyond the Glimmering Lights by Trish Geran, she describes how the local NAACP president, Dr. James B McMillan, a local dentist, received instructions from the national NAACP organization to take action against segregation in their community. 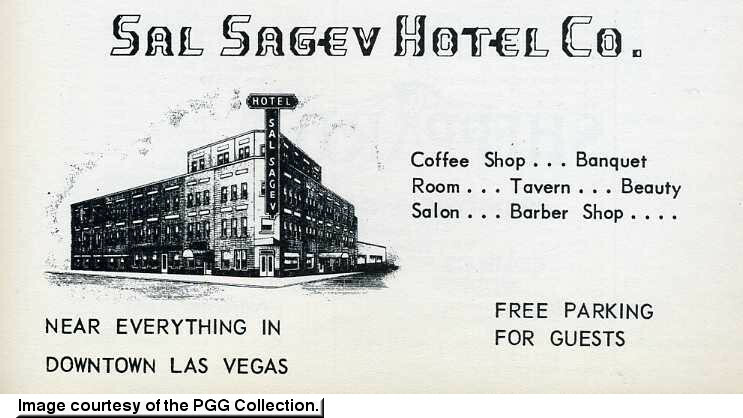 In a letter to Las Vegas Mayor Gragson McMillan stated that their number one segregation problem was the hotel casinos. After getting no response from the mayors office the Las Vegas Sun published McMillan's letter. The local NAACP threatened to march on the casinos on the Las Vegas strip. After various meetings and negotiations the casino and hotel owners agreed to integrate as of March 26, 1960 in an informal agreement. To make sure that the “understood law” was being followed, McMillan decided to form groups of 10 people made up of NAACP members and test the hotels. They were to simply go into the casinos and gamble and see if they were accepted. Each group found they were allowed to gamble among the white patrons and granted access through the front door. 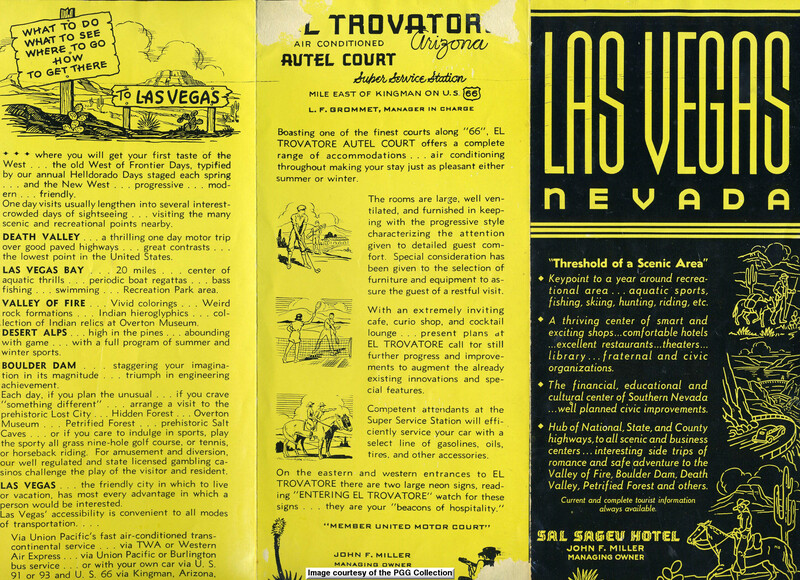 They were welcomed at the tables in all of the casinos except Binion's Horseshoe and the Sal Sagev. McMillan then decided to take a paraplegic black man named Alan Sharp with him and see if they could gain entry along with another member of the NAACP board. McMillan stated that “not even Abe Miller could throw out a man in a wheelchair.” He was wrong... All three were evicted from the casino. This led to a protracted legal battle which solved nothing when Judge Marshall dismissed the complaint. In the end however, in McMillan's opinion, it was the mob that desegregated Las Vegas. They had too big an investment made in Las Vegas to allow the integration problems to upset the balance. When the politicians couldn't make a decision, the mob made it for them and integrated the casinos. It's just good business. Three views of the Sal Sagev over time. Click the photo to enlarge for more detail. Las Vegas Hotel at 19 Fremont and the Sal Sagev Hotel on the corner. In the background is the Union Pacific Railroad Dept. 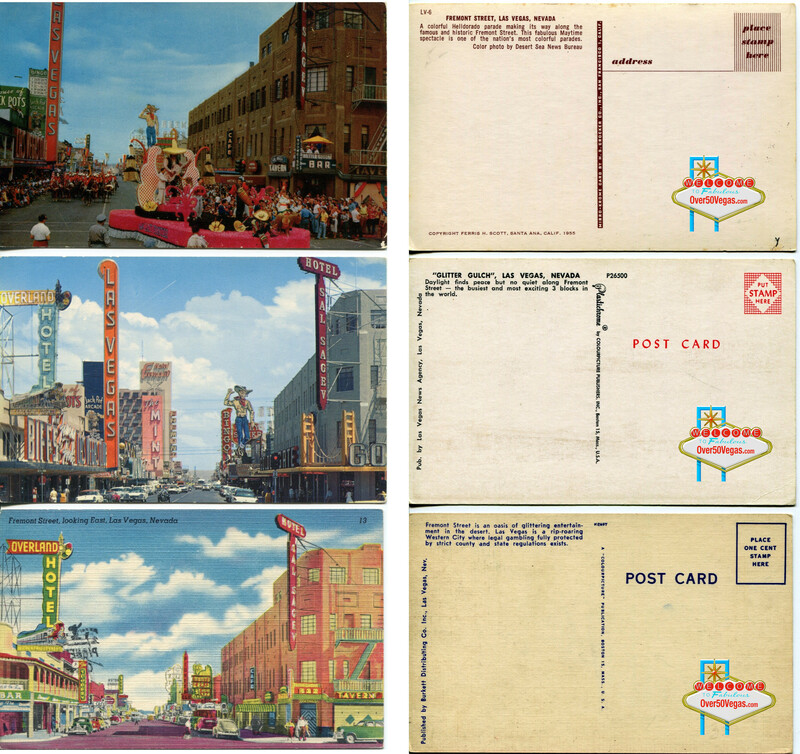 This is part of the front of a Union Pacific Domeliner City of LA Menu from 1960. Click on the image above to see the whole menu including the inside. in 1967 after one of its many remodels. 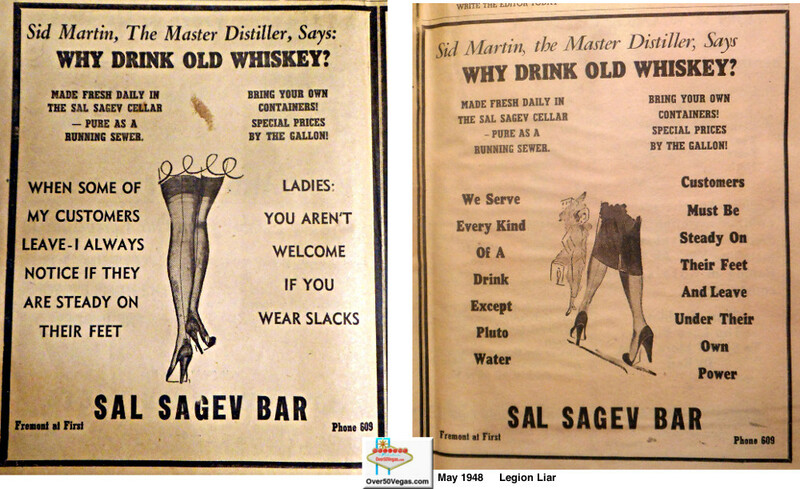 A couple of bawdy ads for the Sal Sagev Tavern in the May 1948 Legion Liar. 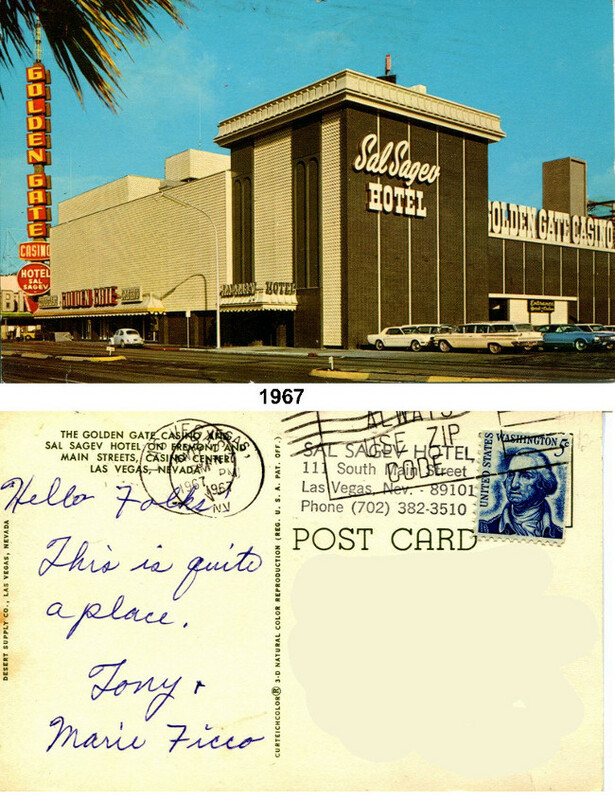 Original Sal Sagev stationery with an envelope postmarked 1952. 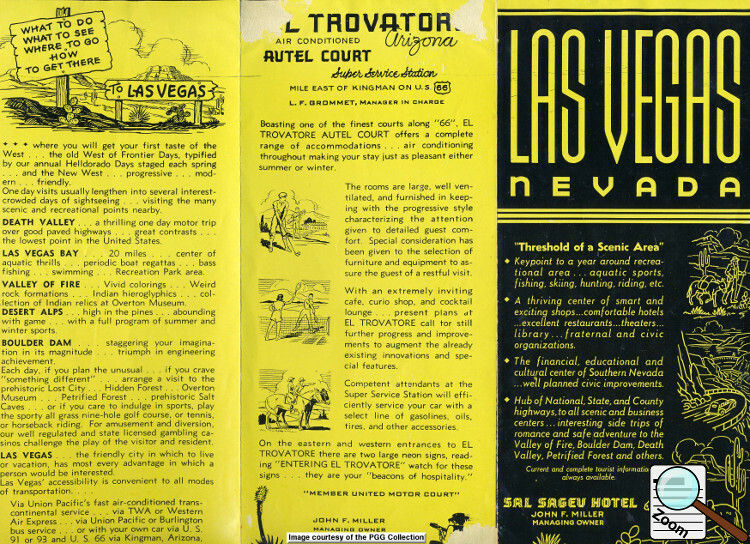 Both sides of a great travel brochure of the Las Vegas area courtesy of the Sal Sagev and the El Trovatore. Click images to read a larger image. 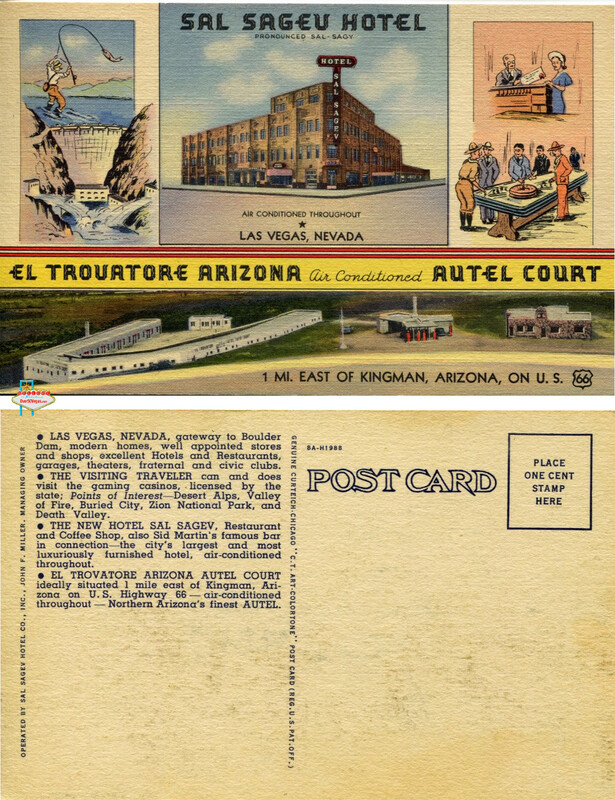 El Trovatore Arizona Autel Court near Kingman, AZ was also owned by Abe Miller and his sister Mrs. Helen Nuget. There's more Sal Sagev on the next page!